John Masters Organics Leave-in Conditioning Mist is a lightweight, nutrient-rich mist that provides a daily boost of nutrients for healthy, soft strands. It detangles and helps smooth frizz flyaways and split ends, and is rich in ingredients that help combat damage caused by pollutants, sun and environmental aggressors. Perfect for styling and creating natural looking-shine, this mist can be used post-shower and also throughout the day to revitalise locks. Aqua/Water, Aloe Barbadensis Leaf Juice (Aloe Vera)*, Coco-Glucoside, Calendula Officinalis Flower Extract (Calendula)*, Camellia Sinensis Leaf Extract (Green Tea)*, Hydrolyzed Barley Protein, Glycerin*, Guar Hydroxypropyltrimonium Chloride, Cananga Odorata Flower Oil (Ylang Ylang)*, Pogostemon Cablin Oil (Patchouli)*, Citrus Paradisi (Grapefruit) Peel Oil*, Cedrus Atlantica Bark Oil (Cedarwood)*, Chamomilla Recutita (Matricaria) Flower Extract (Chamomile)*, Rosmarinus Officinalis (Rosemary) Leaf Oil*, Urtica Dioica (Nettle) Leaf Extract*, Citrus Limon (Lemon) Peel Oil*, Pelargonium Graveolens Flower Oil (Geranium)*, Linum Usitatissimum (Linseed) Seed Oil*, Borago Officinalis Seed Oil (Borage)*, Helianthus Annuus (Sunflower) Seed Oil*, Brassica Oleracea Italica (Broccoli) Seed Oil*, Sodium Benzoate, Potassium Sorbate, Citric Acid, Benzyl Benzoate^, Benzyl Salicylate^, Farnesol^, Geraniol^, Limonene^, Linalool^. 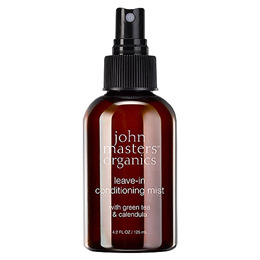 Mist onto damp or dry hair, focusing on entire strand. Follow with styling product as desired. Below are reviews of Green Tea & Calendula Leave-in Conditioning Mist - 125ml by bodykind customers. If you have tried this product we'd love to hear what you think so please leave a review.